The old covenant was hand-written on a sefer (scroll) and placed beside the ark (Dt. 31:26). It is now obsolete, because all it offered was animal blood as directed through the old priesthood (Hebrews 8:13). This process was replaced by the renewed Covenant through Yahusha's one-time offering His own blood, providing for the complete redemption of all mankind. The Ten Commandments are eternal, and is the Covenant of marriage between Yahuah and all those He calls to become His bride. It was written in the stone tablets inside the ark, and Yahusha has written a love for these Ten Words on the tablets of our hearts. The Circus has deceived billions up until now, the Truth will set you free. Come out of Babel, and stop being deceived by that old harlot. Are You A BEL (Baal) Worshipper? Let's find out. Do you eat ham, go to a steeple on Sun-day, and pay some guy to tell you to disregard the Ten Commandments? Who do you call on as the Redeemer, "JESUS?" People will automatically say "We don't speak Hebrew" so we call Him whatever we want to, and He knows our heart so it doesn't matter. What would AliYahu (known as Elijah) say to that statement? Imagine AliYahu standing at Mt. Karmel lifting up his voice in front of that huge crowd of LORD-worshippers (BEL means LORD) saying, "Hashem / LORD / GOD / Adonai / or Whatever-your-name-is, show this crowd of dummies that you don't care what you are called, and bring fire down to consume this offering I've set up here!" Or AliYahu could have said, "We don't speak Hebrew, so we'll call you what our fathers handed-down to us through the Greek and Latin replacements for your Name, Adonai, Kurios, Dominus, and LORD." We seem to have no problem saying Belshazzar, Danial, Nimrod, Adam, Kush, shalom, and every other Hebrew word, and yet to speak the Names "Yahuah" and "Yahusha" is upsetting to the teaching authorities. They accuse those who speak the Name of committing blasphemy, yet to replace His Name is the true blasphemy. Yahuah's opinion is the only opinion that matters, yet He realizes we are confused (since the days of Nimrod and the tower of Babel), and only those who diligently seek Him will know His Name. Read YashaYahu (Is.) 42: 8 & 51:7, to see that Yahuah wants you to know His Name, but when you know it and use it, you will be shunned by the crowd. People are very selective about what they want to know, and what they do not want to know. 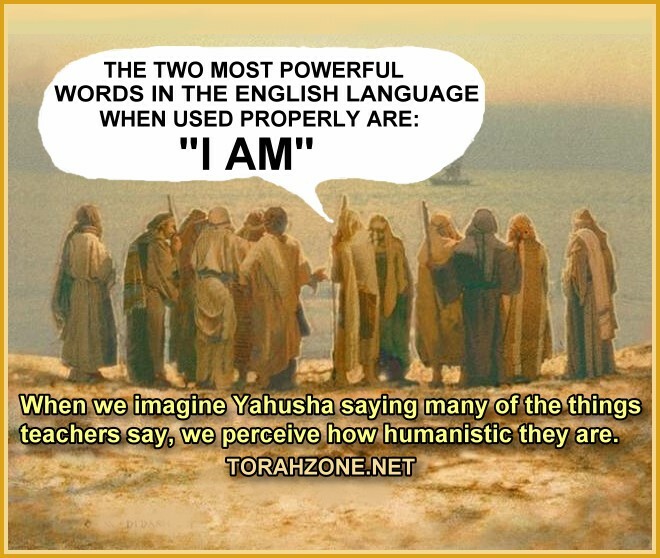 Imagine Yahusha saying many of the things teachers say. Many statements we hear teachers make have no Scriptural basis, but rather mimmick the activity of sorcerers who bend forces or cast spells. They reflect Nimrod's mindset and are based in humanistic approaches. They promote the worldview that we are causing the world to improve around us due to our own efforts and activities. This is what Nimrod taught, and it is Humanism (a philosophy). They often refer to their GOD. Their GOD is not Yahuah. 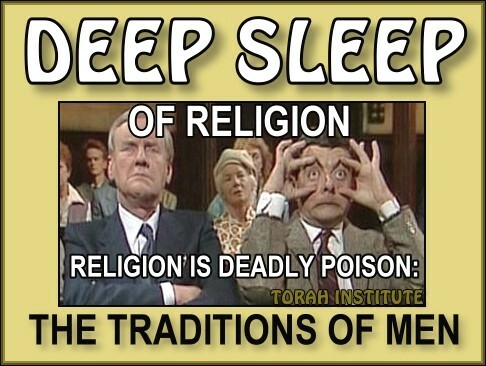 Their GOD is an imaginary force most people try to manipulate with their prayers. "You've enabled GOD," "prayer can cause GOD," "to send signs, wonders, or miracles your way," "your prayers cause GOD to act," "you have the power within you," . . . these are the words of sorcery, not the words of a servant of Yahuah. Who is this nameless being "GOD" that is being enabled by prayer? The ambassadors of the coming reign of Yahusha are here to bring the message of repentance, the message of AliYahu. It's available for all to read at Malaki 4:1-6. The next time you hear a profound statement made by someone who appears to be someone important, put those words into the mouth of Yahusha for a moment, and you'll realize how shallow they are. “And become doers of the Word, and not hearers only, deceiving yourselves. Because if anyone is a hearer of the Word and not a doer, he is like a man who looks at his natural face in a mirror, for he looks at himself, and goes away, and immediately forgets what he was like. 24:3-6: “The Earth is completely emptied and utterly plundered, for Yahuah has spoken this word. The earth shall mourn and wither, the world shall languish and wither, the haughty people of the earth shall languish. *Toroth - plural of Torah, teaching. Jer. (YirmeYahu) 23:36. The teachers failed to tell us the Covenant is “everlasting,” but insist it has been “done away” and “nailed to the crux.” The Alexandrian “fathers” have lied to us, yet their teachings are passed down to all the pastors receiving tithes to spread their message (gospel) of lawlessness. This is the only reason, according to all Scriptures, why the earth shall be burned in the day of judgment – see also 13:9, 13:11, 26:21, 66:24, Mic. 5:15, Zeph. 1:2-18. "Rabbi, what good thing must I do to attain eternal life?" ‘Why do you ask me about what is good?’ Yahusha replied. ‘There is only One Who is good. He was referring to Ex. 20, Deut. 5, Lev. 19. The Torah defines what is sin (1 John 3:4) - but if we are programmed to disobey for whatever reason, thinking what was a sin is no longer a sin because of our “liberty” from the Commandments, we have come under the influence of a serious delusion, and our “seared” conscience will not warn us of the problem. Our liberty is from SIN, not law. The cheirographon (list of our crimes) was nailed to the stake, not the Torah that defines what crime is. These Commandments are the Covenant, and Yahusha is the Mediator of this Covenant, Who will write them on our hearts if IF we repent (turn away from ignoring them), promise to obey Him, accept His atonement for breaking them, and be immersed, calling upon Him in the one Name given among men for deliverance (Acts 4:12). 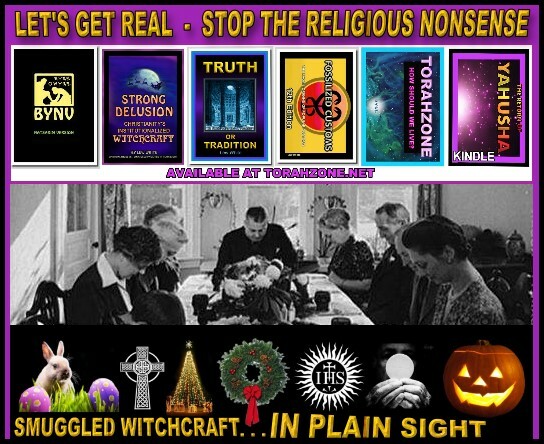 It is NOT unconditional - this is how people are tricked by false teachers. It is definitely conditional. Many people will cry "legalism!" It is good to be legal, We certainly don't want to be lawless. Pastors do not generally answer this greatest question in the same way Yahusha does. Are the Commandments for Christians, or not? The word "TORAH" refers to the Covenant, or Ten Words. Torah means "instruction." Metaphors for Torah: Word, Light, Truth, and Living Water. It is to be lived, abided in, or obeyed. The "law" which is often spoken of by brother Paul in many cases is the CEREMONIAL LAW which dealt with animal sacrifices for sin, or the law's consequences for disobedience (death). These consequences remind us of our need for atonement, as well as ceremonial requirements such as adult circumcision. The blood of animals could never cover sin permanently, it only reminded us of the seriousness of sin against Yahuah. Sin is an infinitely great debt, and we could hardly pay the interest on the debt with animal blood. Yahusha stepped into the world to pay our debt in full. The Torah which defines sin is teaches love, and it will be in place forever, throughout eternity. 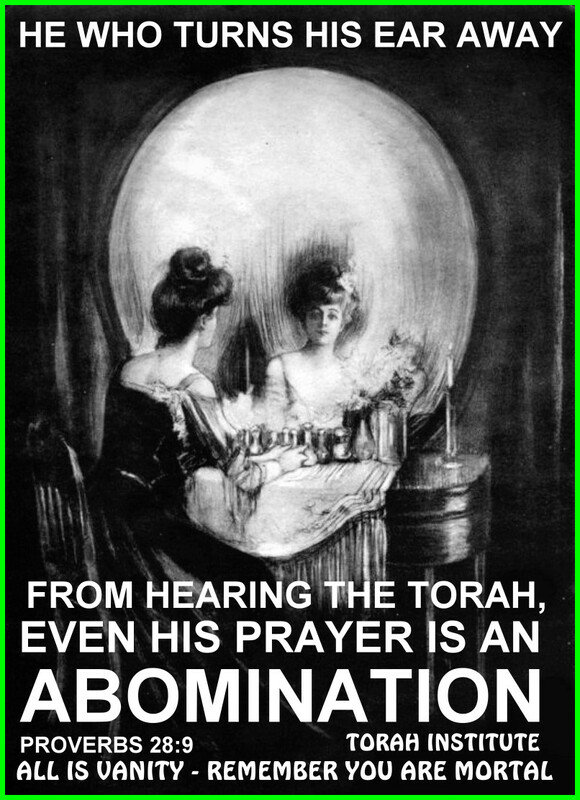 Without the Torah, we would be unable to DEFINE sin (see 1 Yn. 3:4) and love would grow cold. Without Torah, love is impossible. Love is the purpose and goal of existence, and why we are here. This is a point of stumbling for those who have not yet submitted to Yahuah's RENEWED COVENANT: allowing Yahusha to write the Torah on their hearts (Jer. 31, Heb. 8, 10). The following article may be worth copying and sharing with others who can't easily understand why we SHOULD be obeying the Torah. They must learn how their relationship with Yahusha involves His infusing His Torah into their heart, and this is the circumcision of the heart (Romans 2:29). Torah is usually translated “law” but actually means “teaching.” The 10 Commandments are our wedding vows - the marriage Covenant. Yisharal (Israel) is Yahuah’s wife and all who join to Yahuah do so through the Covenant. Our obedience isn't what delivers us, but it is evidence of our believe in action. 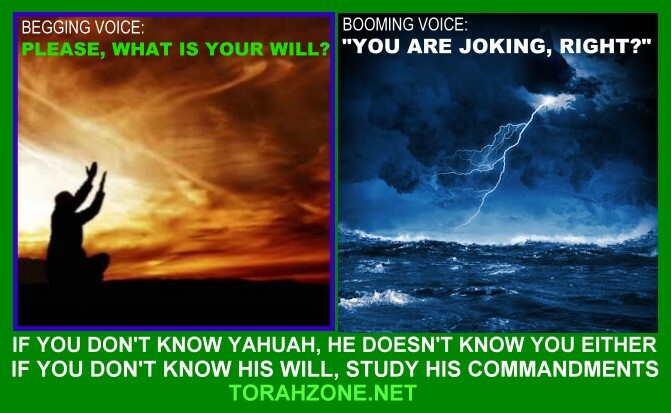 Our wills are controlled by the TORAH, or living Word (Heb. 4) -- which is the mind of the Spirit of Yahusha. Acts 5:32 says that the Spirit (of Yahusha) is only given to those who obey Him. This is receiving a love for the TRUTH, and since His WORD, the TORAH, is what TRUTH is, receiving a love for it changes our wills, and the result is we walk in a mind of the Spirit, loving the Commandments. Receiving the Mind of the Spirit of Yahusha is the new Covenant, as He promised to write them on our hearts (minds). This is the opposite of the renewed Covenant. If we refuse to receive a love for the Truth, His Torah, then He sends us a strong delusion to believe the "LIE" -- that obedience is unnecessary. This is the secret of lawlessness, called the mystery of iniquity. Satan pulled a delusion on the woman in the garden of Eden, leading to disobedience. Simply believing Yahusha died for our sins so that we can continue to disobey and keep on sinning willfully is the very thing Hebrews 10:26-28 directly refutes, as well as the often quoted 10:16,17. Yahusha did not come to "save" us from His Torah. First: the message of the Kingdom is “REPENT, for the reign of Yahuah draws near.” (stop sinning, and return, turn back to Torah) -- it is a mystery, veiled to those Yahuah does not call. This message is the one our Rabbi Yahusha said over and over, and it is what is called "the gospel". He enables us to love the Commandments by His supernatural power. This is a light yoke, but it comes with worldly costs attached -- persecution for righteousness' sake. His 'beef' with those of His religion in that time was only concerning the things that were ADDED by human tradition, He did not found or invent any NEW religion at all. An Israelite does not have to change his or her walk, but a Gentile must stop being a Gentile, and through the Covenant BECOME an Israelite. Yahusha does this by converting our hearts. Second: the New Covenant is having the Torah written on our HEARTS, as you will see if you read Jeremiah (YirmeYahu) 31, Hebrews chapters 8 & 10. The same laws (or more accurately "teachings") are written on our hearts by Yahusha's Spirit, enabling us to LOVE them. This is what happened for the first time at "Pentecost" (Shabuoth). This is now our “circumcision”, and it is pictured by our immersion in water (Col. 2:11,12). He said, "If you love Me, keep (observe, obey) My Commandments". When we are convicted of our sinfulness, we are to repent of our sins, and obey. The Torah (10 Commandments) DEFINE what is a sin, 1 John 3:4. Please read 1 John 3:22-24, and see if anything harmonizes with what we're discussing here. Yahuah's Covenant is clearly for any foreigner who joins themselves to Israel -- see Isaiah / (YashaYahu) 56. There is no covenant in Scripture with any people but Israel, and Israel is 12 tribes, not only “Jews” (Yahudim). Israel is Yahuah’s wife (or bride). Those observant of Shabath / Shabath will be brought to His set-apart mountain, and be among His people (see Is. 56, and 66). Actually, the Sabbath is the test, to see whether, or not, we will obey His Commandments. (see Exodus 16:4). Reading Acts, you will see the word “Sabbath” often—and this is not Sun-day. 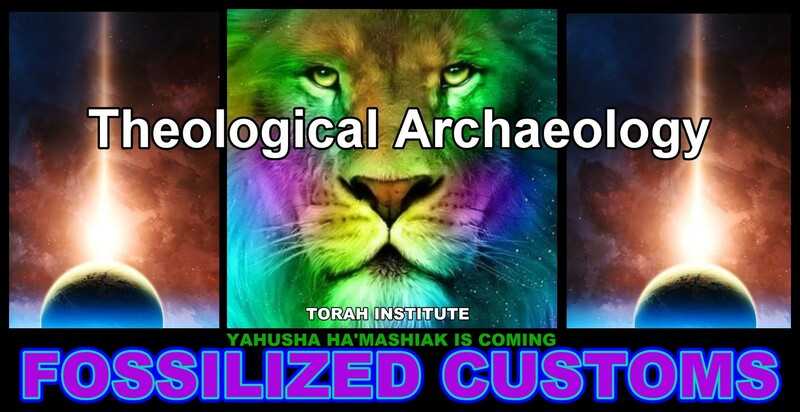 Yahusha is the "Master of ha Shabath," yet Christianity outlawed Shabath at the Council of Laodicea (363-365 CE). The act of resting on Shabath is the “sign” of the eternal Covenant, and it commemorates CREATION, and shows Yahuah you are His and acknowledge Him as Creator. Try to find in Scripture where legalism (according to Torah, not human traditions) is ever a problem for anyone's salvation. Human legalism is rampant -- look at Sun-day, Easter, Christmas, and so on. Easter is Ishtar, the Earth Mother; Christmas was originally the birth of the SUN, and is therefore Satan’s birthday. These things are invented by men, and are not found anywhere in Scripture. If you don't observe them, you're considered strange. They are men's laws, or legalism. It's lawlessness, the ignoring of the Torah (walking in darkness), that will condemn us, and this is what Satan has been so successful in promoting. You could begin by reading James 1:23, and the entire chapter 2, where "faith" is perfected by "works". We show our faith by our obedience. This is not in conflict with Ephesians 2, because the "gift" is our faith, which enables us to do good works, such as observe the Torah (Eph. 2:10). The unconverted human who is still in the "mind of the flesh" interprets the Scriptures seeking out lawlessness from the dark point of view, and will not submit to the Torah of Yahuah, nor can it do so. But, the mind of the Spirit enables us to obey, because we AGREE with the Torah, and love it. I love the Commandments of Yahuah, and teach them. Yahusha told us that whosoever keeps and teaches them will be called great in the Kingdom, but whosoever annuls the least of them will be the least. Romans chapters 6 through 8 will explain the New Covenant to you. The 3 apostles who were “supports” (Gal. 2:9) were James, Peter, and John (their real names were YaAkob, Kefa, and Yahukanon). Their letters should have followed Acts, since they are foundational. Paul’s letters refine details, and can easily confuse those who are not well-grounded and taught correctly, as Kefa warned us at 2 Pet.3:15-17 (He said the untaught distort the meaning of Paul’s letters, and become lawless). Yahusha is near, ask Him to reveal the Truth to you -- and write His perfect Torah on your heart. Then, you will begin an incredible task He has prepared just for you to go and teach others all He has commanded, and immerse them into His Name, Yahusha. You will see your teachers (the Commandments), and hear a voice behind you, saying "This is the way, walk in it." You will love obeying. Your obedience is your way of showing Yahuah that you love Him, and is evidence of your being saved, and evidence of your faith. 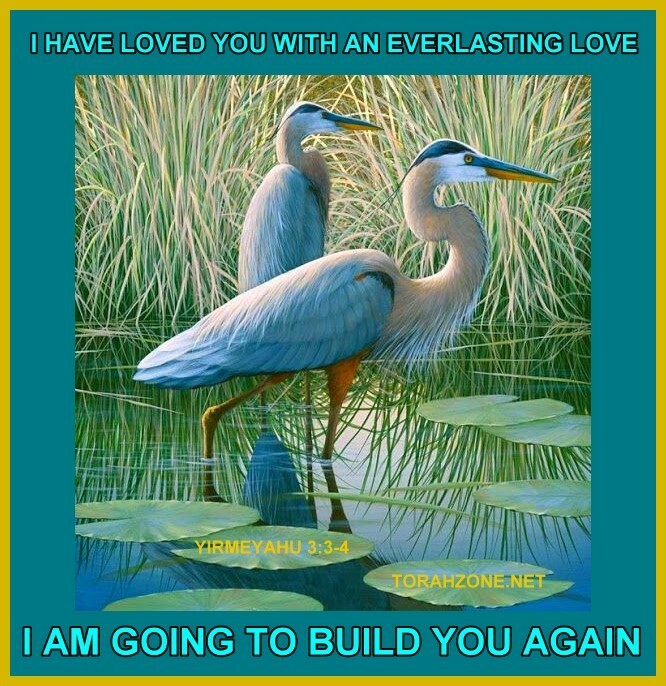 That's being FAITHFUL to Yahuah, our Husband. He refers to disobedience and syncretism (mixing) as harlotry. We can't make up our worship - that's what Cain did. The congregation of Israel has been re-named by men. They now call it the Church (We call it the CIRCUS). To get rid of the Commandments, especially that "Jewish" Commandment called the Sabbath, they had to get rid of Israel, and pretend the Church is now spiritual Israel. This is called Replacement Theology, or Supersessionism. There's no Scripture supporting this idea. 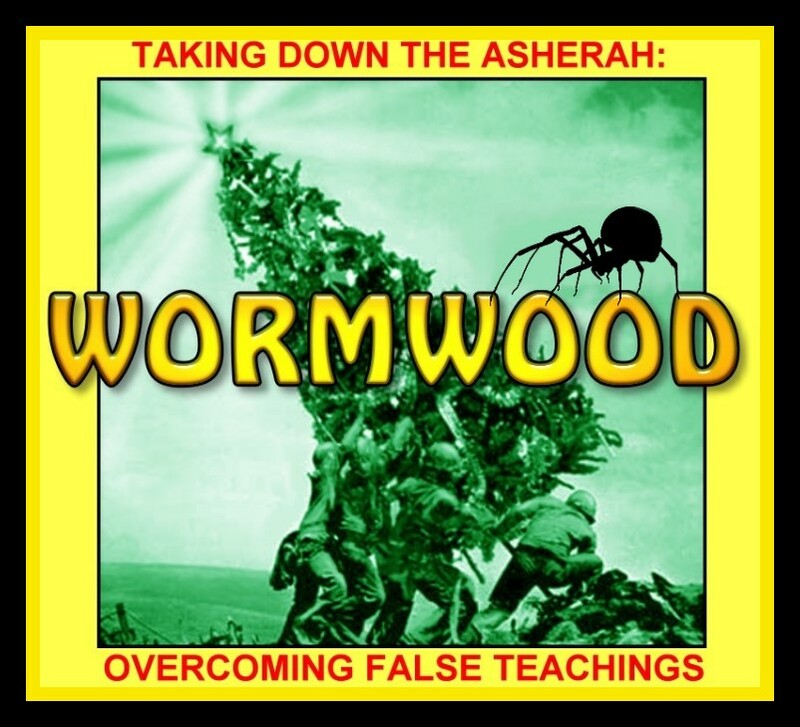 We who have been awakened and have overcome by the blood of Yahusha know that the lies are predicated on people believing this Replacement Theology. They believe they have "replaced" Israel, and no longer have to obey the Covenant -- the Everlasting Covenant -- made with Israel. The TRUE Israel of YaHUaH is the wife/bride of Yahusha, and they "keep the Commandments", and will be able to enter into the gates of the city (New Yerushaliyim). Outside will be those who do not obey, called the dogs. There are only two "denominations": dogs, and Israelites, the children of Yahuah who love and obey Him. Long ago, when ha shatan joined and corrupted "the Church" from within, things became so twisted and confusing that even educated men found it difficult to detect what was of human design (humanism, man's way), and what was expected of us from the Words of Scripture. During the 4th century, Replacement Theology was enforced under pain of death, since the Natsarim were displaced by the new Greco-Roman religious powers which were to become CHRISTIANS, under the moniker Catholicism (Universalism). Our faith is Yahuah's gift to us. We are being delivered by the unmerited kindness (aka grace) of Yahuah, THROUGH our faith, which is His gift to us, resulting in our future obedience.